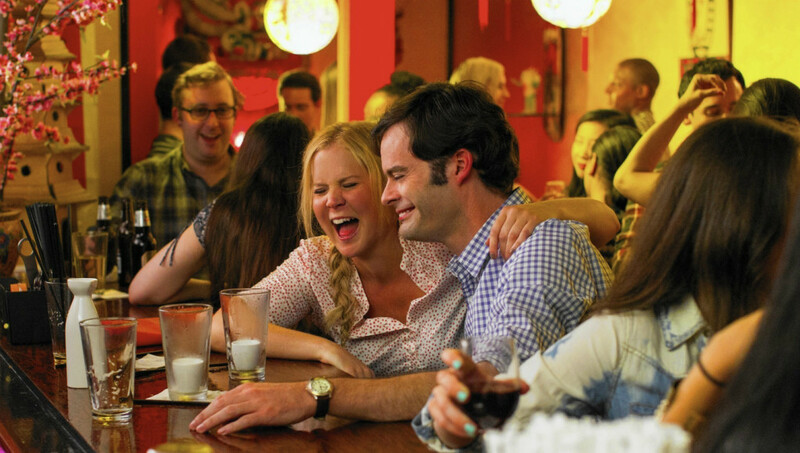 Trainwreck is much more than a vehicle for rising comedic star Amy Schumer. It’s easily Judd Apatow’s strongest work as a filmmaker, evidence that Schumer’s honesty flows through her long form screenwriting, and the best romantic comedy this critic has seen since 2008’s criminally underrated Definitely, Maybe. Definitely, Maybe is a standard sort of rom-com, where Trainwreck sends home the same type of charm but also reflects contemporary pessimism towards romance. It isn’t all rainclouds, however. Through Schumer’s bluntness and Apatow’s knack for finding authentic emotions behind loud personalities, the pair also highlight the euphoria and nervousness of finally finding “the one”. In a story that could possibly be semi-autobiographical, Amy (played by Schumer) grew up resenting true love and monogamy. Her bitter father Gordon (played by veteran comic Colin Quinn) had nothing but bad things to say about it after his turbulent divorce, and its an attitude that has stuck like glue with Amy – a lewd lush. Her sister Kim (played by Brie Larson) has gotten married and is perfectly happy; no matter how hard Amy chirps at her. Relationships are temporary for Amy, who sleeps with hunks and just as quickly sends them out the door. This scenario is a flip on the usual one-night-stand stereotype, and the guys know it. We see the puzzlement on their faces once they leave Amy’s apartment. She meets her match when she’s assigned an article to report on for the crass rag she writes for (the magazine pens articles like “Are You Gay, or is She Just Boring?”). Bill Hader plays a sports physician named Aaron, whom is wrapped up in his high-profile profession but isn’t too busy to be charmed by Amy’s challenging personality. He finds himself falling for her, and likewise for her. However, her commitment issues have her resisting a connection that could be too good to be true. Along the way, Schumer skewers pseudo-journalism, pretentious dating, and modern day apathy. While she makes us laugh, the supporting players help carry the material and open themselves up for any chemistry that might exist between them and Schumer’s crabby ways. The cast is equally balanced by experienced actors (Tilda Swinton, Ezra Miller), familiar comics (Mike Birbiglia, Dave Attell, Jon Glaser, Vanessa Bayer, Randall Park to name a few), and professional athletes (including John Cena, Amar’e Stoudemire and LeBron James). The eclectic assortment pays off enormously when Trainwreck offers every performer a fair shot to steal their featured scenes. The film is consistently funny, and surprising whenever an unpredictable source is able to make us chuckle. Apatow has made us laugh before, but his comedies have been uneven as of late. With Trainwreck, he steps away from the role as a writer; giving him more time to focus on certain performances and ease into more dramatic material carefully. Every now and then, a scene unnecessarily builds on tiny details (like riding in a subway, for insatnce), but those are the only moments you feel the filmmaker’s usual ticks edging in. Otherwise, Apatow tests out some new stylistic choices that he’ll hopefully hang on to because of how well they help define his work – most notably those terrific city scaling wide shots. You can also tell Trainwreck is an Apatow joint because the lengthy flick feels as if it has three climaxes. And yes, Ms. Schumer. That innuendo is intentional. Just as your movie made me very happy, I hope I’ve made you very proud.